We would like to introduce you to our new Propane MyTankApp! 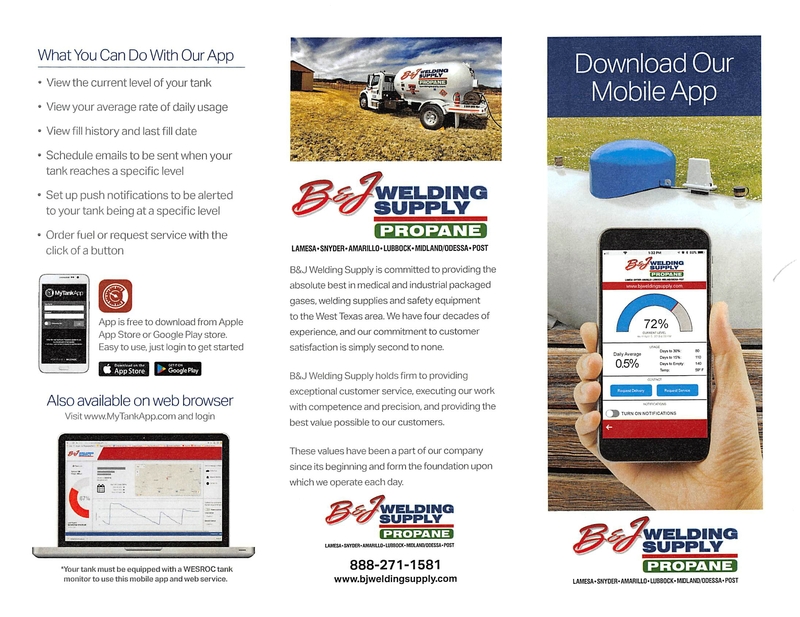 B&J Welding Supply will be the ONLY locally owned welding supply and propane company with our own propane app! Receive push notificaitons on when your tank is low. Schedule a refill without having to leave home and more! Our app pairs with a simple monitor installed on your propane tank. Have more than one tank? No problem. Our app can monitor every propane tank you need. Call or stop by one of our locations to learn more about how to get our MyTankApp installed for you today! B&J Welding Supply LTD, established in 1977, provides gasses, equipment, tools & accessories to the welding, industrial & medical sectors of West Texas and neighboring communities. We also provide propane for all types of residential & commercial applications.